During the spring and summer months, homeowners start getting the itch. HGTV becomes a staple channel in the household and people start making plans to get their dream kitchen upgrade that they’ve been hoping to get for several years. Then they start looking at the budget, looking at the work, and looking at the amount of time a kitchen remodeling job would take, and those beautiful plans and ideas get put on the backburner once again. Well, today is your lucky day! Don’t file away those dreams yet! Bannochie Builders, Inc is a quality remodeling company that will deliver beautiful end results for your kitchen every time! If you are looking for a skilled contractor, look no further than Bannochie Builders, Inc. Our family owned business has been serving the Plymouth, MN community since 1995 and we are ready to build your dreams and give you beautiful end results for your kitchen. Our quality remodeling company will work with you and turn your dreams into reality. As a certified Minnesota kitchen remodeling contractor, our expert professionals know exactly what it takes to design and create your perfect kitchen. We will take out all the necessary permits to complete the renovations and can estimate a project budget and stick to it so that you are always aware of the financial costs you may have! “OMG” is not typically a term we use, but it is something that is always said when we show our customers the final product of a kitchen remodel. We understand that kitchens are the heart of the home so we are ready and willing to listen to all of your plans coming from your heart. We can build any type of style you are looking for – traditional, stylish, or contemporary. We also understand the need for functionality in a kitchen. Having a skilled contractor on your side gives you the ability to create whatever space you may need. Our skilled professionals make us a great, quality remodeling company because we work with you, step by step, to create your perfect kitchen! Upon completion of the project, you will receive beautiful end results for your kitchen that you could only have dreamed of. So don’t delay your renovation plans any longer. If you live in the Plymouth, MN area, let Bannochie Builders, Inc. handle all of your kitchen remodeling needs. 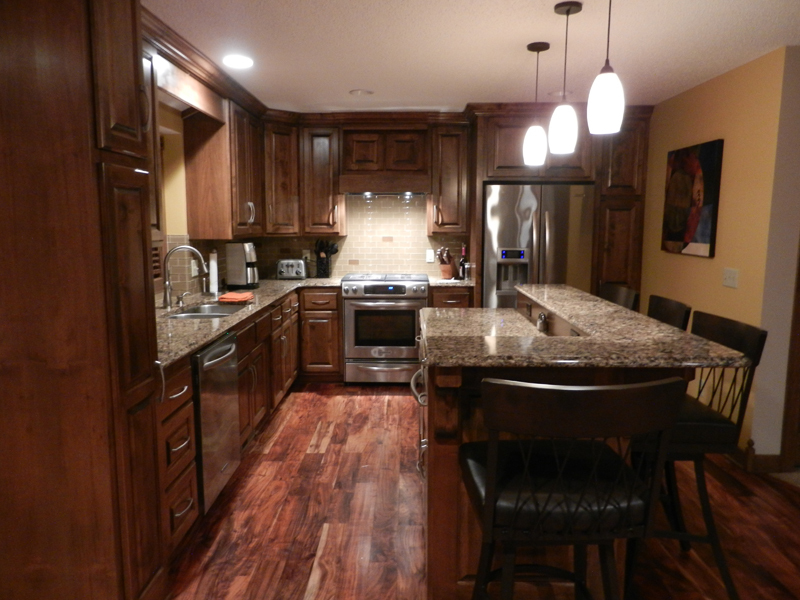 For a great Minnesota Kitchen Remodeling Contractor, call us today at (763) 574-0131. This entry was posted	on Friday, May 29th, 2015 at 9:12 pm	and is filed under Home Remodeling Contractor Plymouth MN, Kitchen Remodeling. You can follow any responses to this entry through the RSS 2.0 feed. You can leave a response, or trackback from your own site.